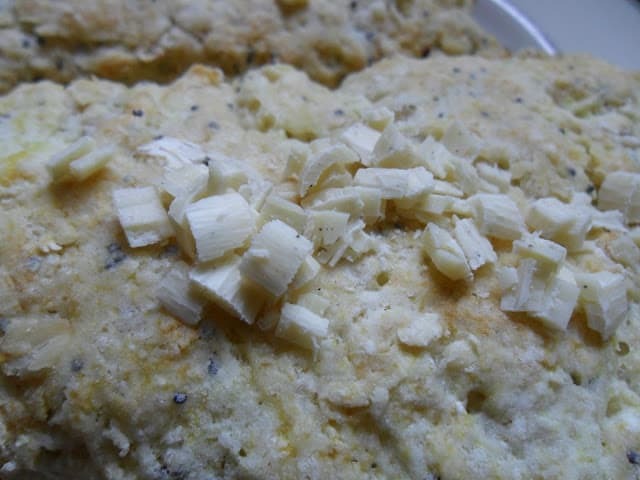 Lemon Poppy Seed Oatmeal Scones are a huge favorite in my house. In fact, anything involving lemon, white chocolate, oatmeal and poppy seeds are all considered game. Made into scones, even better. If you take a peek in my Recipe Box, you will no doubt see that here at Turnips 2 Tangerines we do love our scones. Any kind of scones will do, too. One of my favorite things about making scones is the fact that they are not only easy to prepare but scones are so flexible. Combine any combination of ingredients together and you will have a delicious scone. Hence this recipe for scones. I got a hankering for a scone and the only “add in” ingredients were lemon, oatmeal, white chocolate and poppy seeds. The end result became these tasty scones. Looking for more lemon and white chocolate recipes? 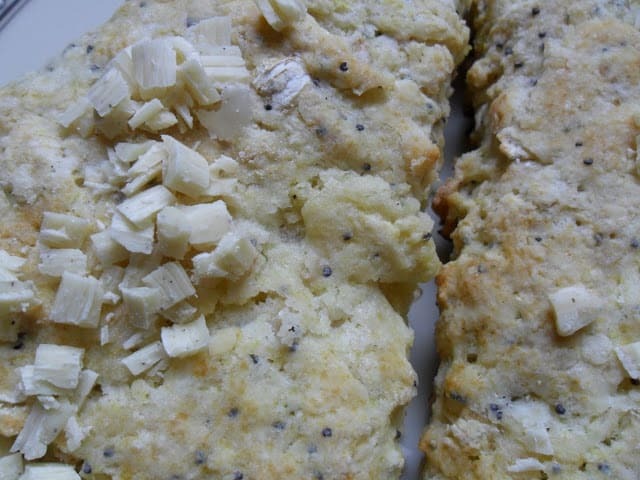 Try this Amish Friendship Bread Lemon Poppy Seed Biscotti. This delicious recipe for Candy Cane Fudge is also made with white chocolate chips. Another favorite flavored “chip” we like to use here on T2T is a fresh tasting lemon flavored chip. We found lemon flavored chips at the Bulk Priced Food Shoppe in Greenville WI and made these super delicious cookies, Lemon Chip Sugar Cookies. Light lemony scones with a touch of white chocolate and poppy seed. Preheat oven 425 degrees. Line baking sheet with parchment paper. In large bowl, combine flour, oats, sugar, baking powder, baking soda, and salt. Cut in butter with pastry blender until mixture resembles coarse crumbs. Add grated lemon zest. In small bowl, stir together egg, lemon juice, and buttermilk. Add milk mixture to flour mixture; stir together until dough forms a ball. 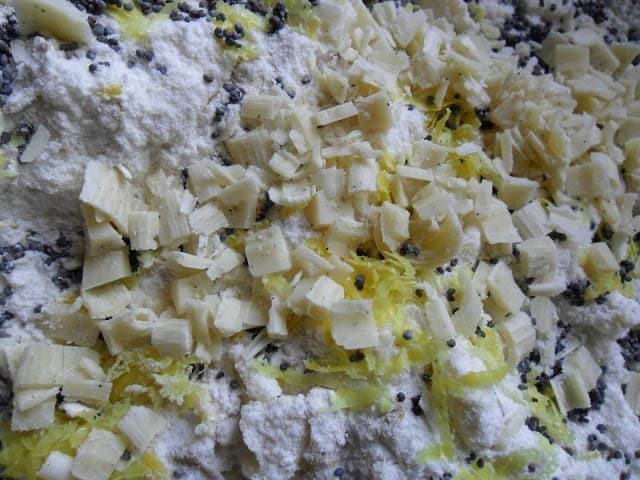 Stir in poppy seeds and white chocolate chips. Turn dough onto floured surface; knead 5 to 10 times. Pat into a 10 inch circle. Cut into 10 wedges. Place wedges onto prepared baking sheet. Remove from baking sheet and transfer to wire rack to cool. *Kitchen Tip: Substitute one (8 oz) white chocolate candy bar shaved, for the white chocolate chips. This recipe was made with Mc Cormick Poppy Seeds.